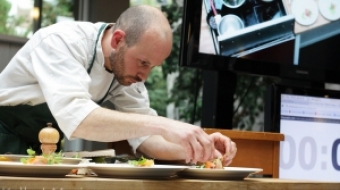 After an intense bout of preliminary heats on Tuesday, and a sweat inducing semi finals and finals, the winner of the Whistler Chef's Challenge has been chosen. Guests were keen on three hours of sampling Asian food, sake, wine, spirits and beer and soaking in the decorations and environment that came with it. As we made our way through the three courses, Luc Trottier, General Manager of Quattro and Jeremy Trottier, Executive Chef, shaved paper thin slices of truffles on each of our dishes. This year's CRUSH Gala lived up to its expectations, boasting a wide variety of quality wines and new vintage releases. Some dressed the part, while same played the part at Cornucopia's first ever High Rollers event last Friday held at the Fairmont Chateau Whistler. Saying an event is one of the the hottest events of the year is a bold statement. Still, that's what the organizing team at Cornucopia claimed House Party would be. Awkward first dates, kilts and goats, sipping wine on the toilet and a hostage situation were the focus in a few of the 20 submissions in this year's event.